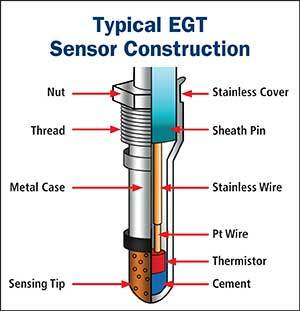 What Technicians need to know before working on a vehicle fitted with EGT sensors. Purpose and identifying correct sensor by the location on exhaust. Precautions when purchasing new units. The number of Exhaust gas temperature sensors may vary on vehicles depending on the systems used. They are utilised on both Diesel and Petrol engines – Turbo and non-Turbo. The purpose of the EGT sensors is to monitor exhaust gas temperatures (at various locations on the exhaust) as an electrical voltage signal and sent to the ECU to allow for controlling varying engine conditions to reduce emissions and component protection. Primarily to protect the turbo charger and catalytic converter from thermal overload. (overheating) The PCM will alter timing, fuel mixtures and boost pressure to lower the temperatures. (results in loss of power) Also used for control and protection from overheating of NOx reduction systems. The function varies slightly for Diesel engines. The temperature of the DPF (Diesel Particulate Filter) is monitored, not so much for heat overload but to establish that the temperature required for regeneration (self-cleaning) of the DPF has been achieved. Also used for control and protection from overheating of SCR (selective catalyst reduction) or LNT (lean NOx trap) and other NOx Absorbers. 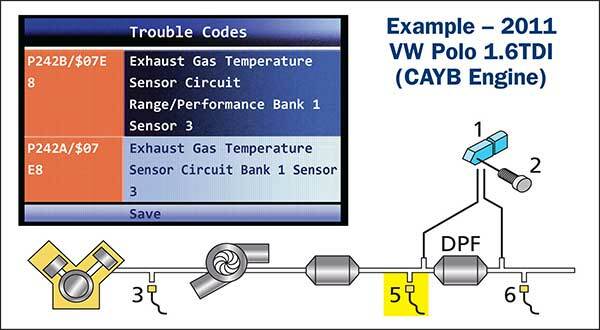 Certain EGR systems are now equipped with temperature sensors for EGR Diagnosis (OBD). Are Compact and have lower Maximum temp measurement. (400Deg C). Other models may have many more sensors downstream for more monitoring. Identifying the EGT sensor that requires testing and/or replacing can be a little confusing when the vehicle Is fitted with multiple units. The OBD 11 diagnostic system uses a listing similar to the O2 sensor identification. Part 5 shown above was replaced and vehicle fault corrected. Disconnecting individual connectors and checking diagnostic codes may assist in identification. Note: It is important that the correct part is fitted in the correct exhaust position. 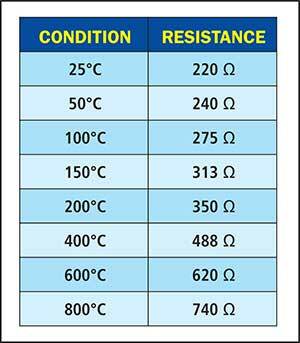 PTC (positive temperature coefficient) Resistance increases with heat. NTC (negative temperature coefficient) Resistance decreases with heat. Monitoring temperatures for typical applications: Diesel Turbo charger, DOC, DPF, SCR and NAC. A sensor over time, can drift out of tolerance limits causing over fuelling issues during Regeneration, due to the process being prolonged. This sensor deterioration may occur over a period. PTC sensors may continue to relay misinformation to the ECU without setting or delaying a diagnostic trouble code. This may cause the DPF to regenerate outside of its permitted temperature range. In many cases, a DPF has been incorrectly diagnosed as a fault where it has been caused by a faulty EGT sensor. Typical sensor fitted to Captiva/Cruze Diesel. 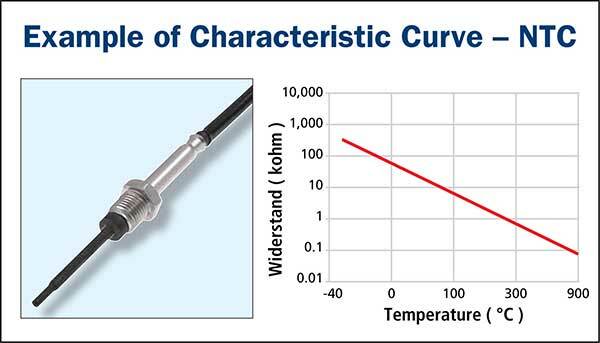 Disconnect and measure the resistance between the two terminals of the Exhaust Temperature Sensor. Compare the readings with the specifications. NTC sensors are generally designed with 2 wires bonded to a ceramic cell. Over time, an open circuit may be created and resulting in a fault code being logged. This is generally a straight forward fix and repair. 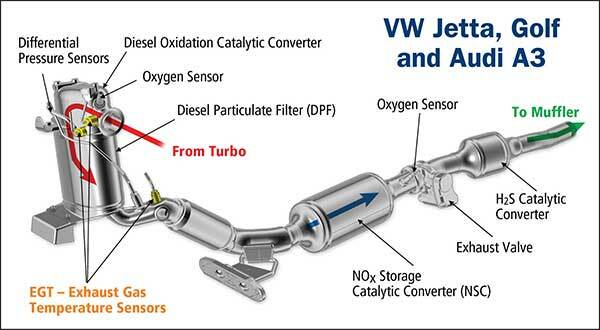 These sensors may be damaged during exhaust replacement procedures and recommended to be replaced simultaneously with any DPF or other major exhaust component fitted with an EGT sensor. Severe vibration may cause internal component or wire connection damage. Excessive prolonged temperature (over 900 Deg) may cause Thermistor element failure. Bending the sensor wires excessively. The sensor is to be refitted at the correct angle to prevent stretching and over bending. Contamination from oil, antifreeze and poor-quality fuel. A suitable scanner can of course monitor temperature readings during on road testing. Ensure correct sensor is fitted to the correct location as they are designed to monitor a specific temperature range depending on the heat created at that location. Ensure wiring harness and connectors are intact. The Premier Auto Trade Emission range includes more than 25 Exhaust Gas Temperature Sensors (EGT), covering almost 400,000 vehicle applications in Australia and NZ.